Click HERE to be taken to the website for more info! This area boasts some of the most beautiful land in the nation. Perfect for those who enjoy the rugged outdoors and a spectacular view—along with basic necessities, such as schools, banking, and utility services. Durango is proud of its diverse culture with a really broad spectrum of lifestyles. People are drawn to Durango from all over the country and the world. 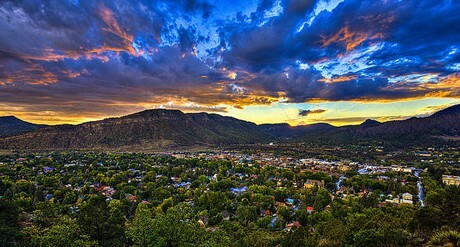 Durango, Colorado, is tucked away in the southwestern corner of Colorado. It is positioned between the Animas River Valley and the San Juan Mountains. With a population of 18,000, this charming town offers a mixture of frontier spirit, natural beauty and friendly folks. The town of Durango is in La Plata County, which has an overall population of 54,000. SPRING brings warmer weather with rain (annual precipitation of 19 in. per year) to brighten up greening lawns and high country meadows. Summer temperatures average around 85 degrees Fahrenheit, often ranging from 70-90 degrees Farenheit. Rivers stay relatively full in the summer due to deep snow accumulation in the surrounding mountains. Fall days are cool and dry, perfect for a mountain hike or drive to see the golden aspen and red-orange scrub oak. Durango School District 9-R serves the community through 11 schools, including 1 comprehensive high school, 2 middle schools, 7 elementary schools, and the Exel Charter School for 6th through 12th grade students. Enrollment has remained steady for the past few years at 4,500 students. Fort Lewis College is a four-year, fully accredited, liberal arts institution and a member of the Colorado State University System. Fort Lewis has 24 degree programs with an enrollment of approximately 3,789 students.The campus sits on 247 acres overlooking Durango with 1,409 students living on campus in 8 residencial communities and apartment complexes.